Home » Articles » It’s that which is in plain sight that you can’t see, that is the most interesting. It’s that which is in plain sight that you can’t see, that is the most interesting. I’ve had a bit of a film epiphany this year. I always loved film, but for many and various reasons, only came to discover the very best of film this year – rather late in life. Maybe not late in life, but a long time later than I would have prefered. In 2001 I saw a “very cute” film at the French Film Festival called Amalie. You may have all seen it. Of course you’ve all seen it. It completely redefined cinema for the next – Oh lordy I don’t know – how long now have we been doing the ‘cute’ thing? The film made an international hit of its director Jean-Pierre Jeunet and its leading lady, Audrey Tautou. At the time I thought the film was sweet, but definitely overrated. I couldn’t quite tell what all the fuss was about. There were so many better films being produced in France, even present at the festival. Then several years later, I lived with a man who adored the film. He was a sweet kind of man who loved a sweet kind of thing and Amalie was completely his style. As a gift to him, I purchased a large Japanese version of the image above and hung it on our wall over the table. The very sweet man and I parted ways, and (perhaps as a snippet of parting revenge) he ‘forgot’ to take the poster with him. I remained in the apartment, and moved on inside. I built a new life for myself, and spent the next twelve months completely immersing myself in art – music, books and film principally. In that time, I came to be quite resentful of Amalie. I was disappointed that my beloved French (I am a devotee of the new wave in many different languages) produced work like this. I was getting a late but thorough education from Godard, Bergman, Dreyer, Bresson and the like and film like this were starting to really get under my skin. This morning, while I was eating my breakfast, I looked up, and noticed for the first time in over twelve months, that I still had the poster on my wall. It hit me quite between the eyes. It were as if it suddenly became visible. Through some strange internal magic, I had been able to miss seeing something with that much emotional weight attached to my wall for an entire year. I took it off my wall immediately. The gum used to hold it in place was enthusiastic and it clutched desperately to a small piece of plaster, but I was quite determined to get it down, so I didn’t care about that. I tore it into pieces. This felt competent rather than cleansing. I didn’t have any particular emotion about it. I felt that something with that much baggage was probably causing me some sort of Feng Shui pain. I burned the Amalie poster. This was a tremendous failure. I tore it up well, placed it in my sink and tried to burn the tissue-like exposed innards of the sturdy poster facade. It produced more smoke than flame and I was left with choking cats and the acrid smell of charred paints. I damaged it enough, but rather than cathartic it felt like another poorly executed action to pile on top of all the reasons I wanted it gone in the first place. Despite the oddness of my burning the thing in my house, the truly weird thing here is that this poster sat on my wall, unnoticed for so long. Under normal circumstances this is nothing as we all get used to our relationships with objects. They lose potency and become part of the comfort zone. But this represented something I had been focussing on. My brain had refused to make the connection with the thing on my wall and the way I felt about moving on, or the film it represented. Life is a strange strange business. 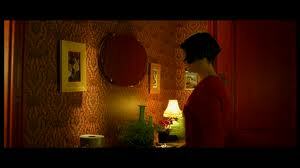 I do agree with you, “Amélie” is a “cute” film but fraught with clichés, very artificial & extremely soppy! (although millions of people loved it at the time in France too, which is generally a bad sign 🙂 The French, apart from a few great film-makers, usually produce terrible films… fortunately, the rest of the world will never hear about them! Perhaps the genius of the French (claimed by a true Francophile) is in their discretion about what they send to the rest of the world? I have to confess, Jenn Breukelaar and I saw a truly dreadful film at the French Film festival this year, but I also must say it was the first really bad one (except MicMacs which I thought was awful – but not cause it was poorly made) I have ever seen at the festivals.